Aside from a couple of small additions, the Grade Export setup process is the same for Infinite Campus and all other schools. 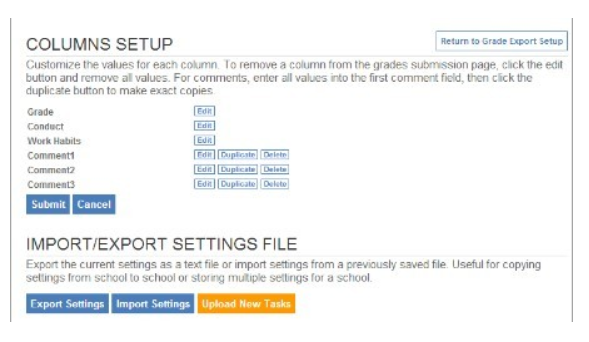 This article will be used by faculty and staff personnel who wish to learn how to upload new tasks, set up columns and select term codes using the Grade Export System page. Log in to School Loop. Click Grade Export System in the Toolbox menu. Click the Upload New Tasks button at the bottom of the page. Upload the tasks.txt file found in the shared drive used by Infinite Campus to store all the data files for Sloopy. 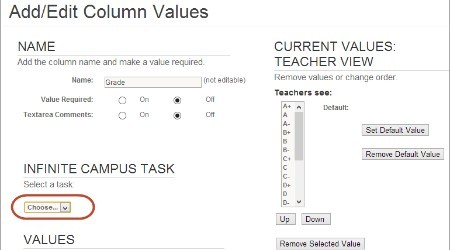 Each column must be associated with an Infinite Campus Task. Use the drop-down menu pictured below to choose a task for each column used in the desired grade export setup. Note: For each marking period, the Infinite Campus task must be set for all columns. This may be done before or after teachers submit grades. Failure to update tasks for each column could result in overwriting grades from the previous marking period. 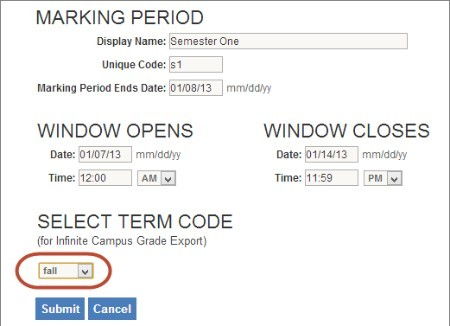 On the Marking Period page, select the corresponding Term Code from the pull-down menu. A Term Code needs to be selected for each marking period.